"Baba would accept with appreciation any small thing offered with love and devotion, but if the same thing was offered with pride and haughtiness, He would reject it. 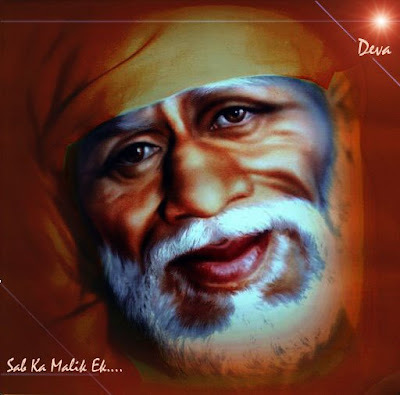 Being Himself full of Sat Chit Anand (Existence, Knowledge and Bliss) He did not care much for mere outward formalities; but if an offering was made in a meek and humble spirit, the same was welcome and He accepted it with pleasure and avidity" - Shri Sai Satcharitha by Hemadpant. "The Guru alone knows the topsy-turvy Suspension, 'with head down and feet up' can give happiness "
BLESSED is the one who knows and recognizes the Greatness of His Guru and thinks of Him to be Hari, Hara Brahmah Incarnate (Trinity of Gods). PATIENCE is the mine of Virtues and Consort of Good Thoughts. FAITH (Shraddha or Nishta) and PATIENCE (Saburi) are like the Twin Sisters loving each other very intimately. PATIENCE can ferry you across the sea of mundane existence and can remove all sins, afflictions and get rid of calamities in various ways, besides casting aside all fears ultimately making for success. Love your Guru with all your heart and surrender prostrate before Him with reverence; then there will be no sea of Mundane Existence to cross over just as there is no darkness before the Sun. One who loves Me intensely, always sees Me. To him this world is a desert without Me. I lead him to Self-Realisation. For I am dependent on him--one, who thinks and hungers only after Me, or who does not eat even a morsel of food without first offering it to Me. "The objects of our life such as Dharma, Artha and Kama are attainable with our effort, but the fourth object, Moksha (liberation), can only be had with the help of Guru "
Baba had the power to completely blackout some lines of thought, e.g., that of returning home from Upasani's mind for eight days after his first visit to Baba. This yogic power, which blacks out completely unwanted thoughts would evidently imply the power to give positive bliss to persons fit to receive it. If a person is comparatively free from sin and vice and could keep his mind sufficiently blank or sufficiently pure even for a while, any ordinary or sufficiently experienced hypnotist with a command could fill his mind with blissful thoughts over a considerable period of time. Baba's yoga sampoorna state enabled Him to keep several people in such happy state as they themselves have recorded in their experiences. Page created in 1.177 seconds with 69 queries.